Due to the overwhelming response of my first post about Crystal Lake a couple of months ago, I’m sharing these outtakes to round out the July 4th holiday weekend. I think it’s an appropriate tie-in considering that Charlie Daniels played a huge Independence Day concert here in the late 1970s and for many years it was a favorite summer destination for thousands of South Georgians. 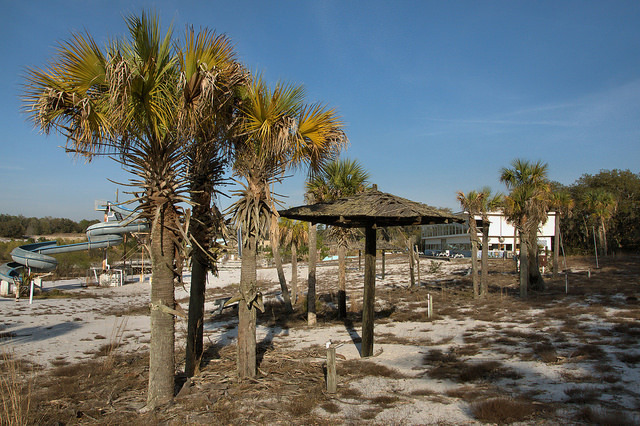 The palm trees weren’t natural to the park, but they sure made it feel more like the beach. Of course, water slides were always the favorite attraction for young and old alike. Lots of people have asked me about the Rampage, which was one of the most popular attractions at Crystal Lake. 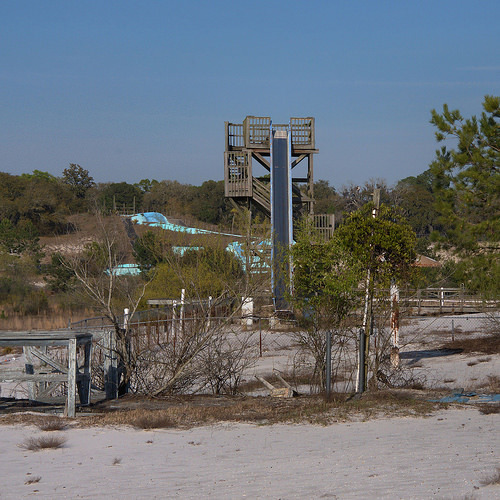 Here are two shots of this high-speed water slide, one from the lake bed and another from the front. 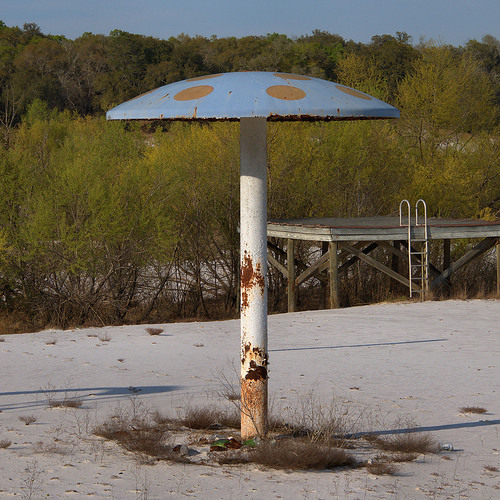 I believe there were several of these metal mushroom umbrellas on the pavilion side of the lake. 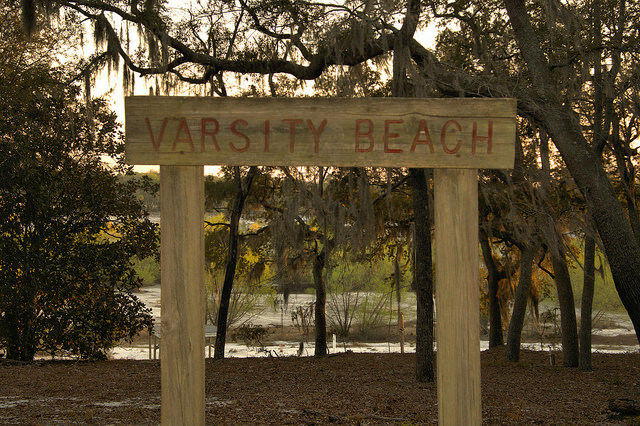 The area known as Varsity Beach was located on the far side of the lake. 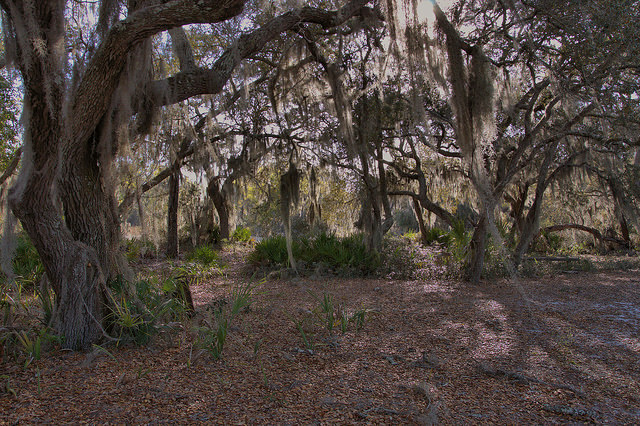 It was more natural than the pavilion side and set in a nice stand of oak trees. 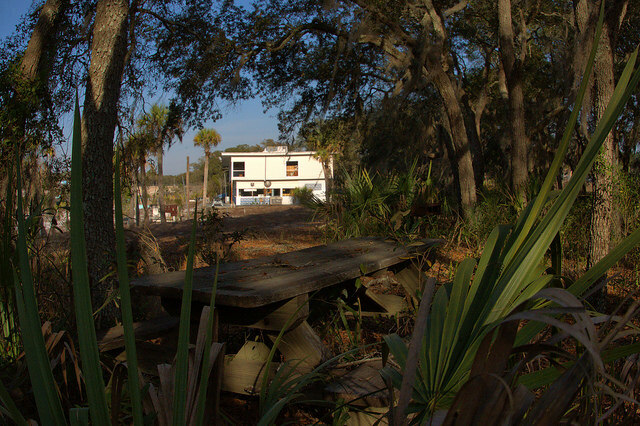 Many hope the lake will once again be a family destination, but this is not likely. This may be the same waterpark but i am not sure. 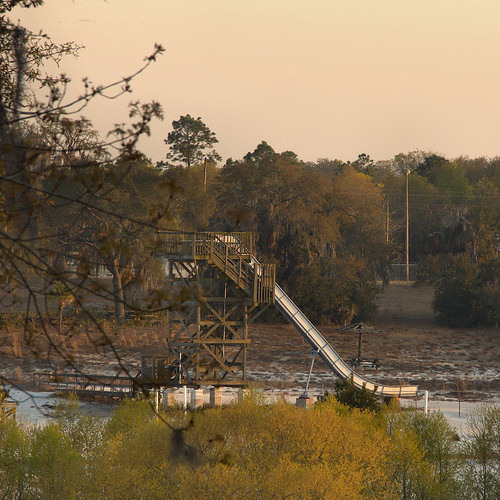 Does anything recall a water park in Augusta GA with some of the slides called the “Black hole” and “Cannon Ball”? I have been looking all over to see if i could find old pictures of it. I don’t know the name of the park, I just remember going there all the time as a child. I remember going there as a child. We truly enjoyed it. I wish it were still open I would love for my children to see it and enjoy it. They killed that lake when they put water slide etc in it. Probably collapse the spring or whatever water source was feeding the lake. I always thought the water slides were a bit tacky.I remember going there when it was just a lake and a cinder block pavillion. The spring end of the lake was wild and undeveloped. but it had a path you could walk around. They messed it up when they “tamed” it. I remember seeing it one time when it had been drained to install the plumbing for the pumps.It seems like this was in the late 60’s. On later visits, we swam out to the pump outlet and played in the mound of water created by the pump discharge. Most people didn’t know it, but you could get on one of the back roads and there was a sinkhole with water in it called Blue sink. Our family went swimming there on several occasions. Later, I took some of my friends there, and it had just about dried up. I guess it foretold what would happen to Crystal Lake. Many a cookout… Many a fun day! So sorry it closed. My grandmother grew up close to the lake. But back then it was just a hog farm, one night they heard a loud rumble and the next morning the lake was there. It always stayed wet and that’s why there was a hog farm there. Apparently it was a large open cavern underground and the roof caved in. I sure miss this place. Please reopen crystal lake. Historic! It seems to me that with all the people that loved the place could chip in for an initial investment for the community and for the economic advancement of the related communities. ESPECIALLY, in this time of drugs, violence etc…give the kids something to do besides get in trouble. I’ll kick in the first $50.00. Maybe the State of Georgia could buy it and turn it into a state park. If there is ever a good case for the use of eminent domain, this would be it. I would love to be allowed to visit with a metal detector. My husband lost his wedding ring there. Omg I use to love going here as a child. Does this place still exist? I loved the water slides this was such a fun place. I remember waking up on Saturday mornings an my parents loading is up an not telling us where we were headed , an then as soon as we hit the interstate we would be overwhelmed with joy cause we knew , I also remember my dad telling me if I couldn’t tote my own raft up the stairs of the tall ride ( name escapes me right now ) that I couldn’t ride it . those were the good old days though , awesome share !! I really do wish it would. The property is not publicly accessible Noel. I worked at Crystal Lake for several summers when I was on high school! Thanks for bringing back some great memories. I’m afraid Mr Adcock will never reopen this park. I begged my uncle Donald Adcock to plead with his brotherAN.Adcock to reopen this park when he closed it but my efforts were in vain. it is truly a sad day when such a wonderful place gets closed down for good. Why in the world would they not open it back up. The place just sitting there doing nothing with so much history behind it that is sad and not thought out wow. I would go there and spend the whole day, take a cooler full of soda, juice, & water and things to make sandwiches and chips. It was a great place for kids of all ages even us grown up ones. Ahhh such memories. We had the best of times during the summer at Crystal Lake. The Rampage was so awesome to go flying down. Remember getting my hind end sun burned there a many a day, but I would finally turn a pretty golden brown. Would be so nice if the place could be cleaned up and brought back to life. I had so many memories here. Its so nice to see other people remember too. The last time I was there there was trash and dirty diapers everywhere, even in the water, thanks to the idiots that ruin a good thing (you know who they are). I use to love going there during the summer and playing all day as a kid. It would be awsome if someone could actually get it going again I would be the first one in line. Love the pics it brings back great memories. had many good times over there. saw Charlie Daniels there in 75 I think shame it is in the shape it is now wish in could be re-opend but probably won’t in our lifetime. What really happened to crystal beach??? Did it just dry up? 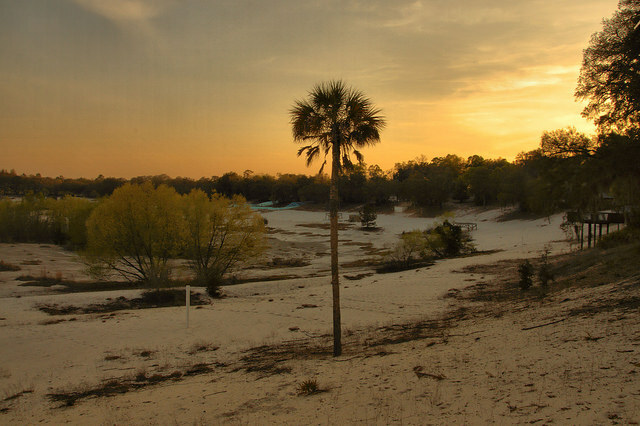 I sure miss this place we need to see about opening it up again so our kids can experience the fun Southwest Georgians use to have….. Thank you for the great pics. I grew up no more than 1/4 mile from Crystal Lake and still live right close to the entrance. I wish someone would buy it and bring it back to life instead of un-experienced hunters killing the wild hogs and throwing them out side the road. And also shooting with no regard to the people that live close by. Crystal Lake is a natural wonder that could be made into an attraction that would be bigger than Wild Adventures. From just an old woman that knows what a beautiful place Crystal Lake is. I respect the owner now and the deputy that lives there. He may be off duty from the sheriff department, but the owner has him living there to watch over the place. There are several natural wonders in this area. Coleman pond, Blue lake and Devils Den. I think all are privately owned now. So glad you posted all the pictures. Been there so many times. Is there any water there now? I loved going to Crystal Lake as a child. The entire extended family went every summer. Thank you for posting the pics. Brings back so many memories. I flew over crystal lake this time last year. It’s closed because of the many drownings that took place. Insurance for the property was unreal. The only greed that was it’s demise were the adults who were too busy drinking/cooking/whatever and not paying attention to children which in some cases, drowned bc of neglect! Ask anyone that worked the ER in those days. I would love to have crystal lake back but not at the expense of losing lives. Great memories of that place! Each summer loading up the station wagon getting buckets of the Colonel’s finest and heading to the lake for a day of sun & fun. And yes there were several of the “mushrooms”. Water came out the top, ran down the outside and showered over the edges. We everyone when walking the ‘beach’ to the next slide. Why can’t it be reopened? I went to Crystal Lake before they ever started building water slides and all that other stuff. There was only the dressing rooms and snack bar. Loved it. Thanks for all the pictures. What happened to the lake? What caused it to dry up? Was it a spring fed lake? 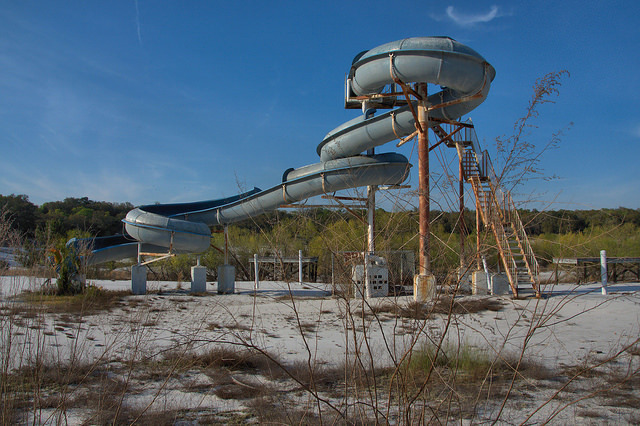 always loved to take my kids there…also enjoyed the slides that had the crisp COLD water….it would take your breath, so cold.., but felt good on a hot summer day! How did you go about getting permission to photograph there? Been looking for a place for a shoot and would love to do it there. You’d have to talk to a member of the hunting club there. Not easy to get access and a deputy lives on the property so trespassing isn’t advised. Wish I could help but I can’t. Thanks for sharing these pics! I remember many Summer’s going to Crystal Lake when I was a child & young teenager with my parents. Memories of the water slides came flooding back as I scrolled through the pics. Sad to see it just vanishing away like this!! Thank you for the pics!!!! Brings back many happy memories of my childhood. Nothing was better than a trip to Crystal Lake!!!! I love Crystal Lake….greed was its disparity! Thanks, for the update and pics! Lots of memories with my family! I was there just last weekend for a Graduation Party at the Deputy Sheriffs house. It is so sad but I was always told that nature could take back faster than man can build, I did not believe that until I saw for myself last week. The Charlie Daniels Band was probably one of the last times we were at Crystal Lake….shame it is in despair. Thank you for your awesome work. OMG! I so remember when this was the place to be! Thanks for the pics. Brings back good memories.